rofessional archivists complain that many archival websites are not archives at all because they lack “provenance,” that is, a firm history of the custody of a coherent body of materials since their origin.12 Instead, their creators have assembled them, sometimes carefully and other times haphazardly, from diverse sources. But even archivists would consider most (though not all) of the one hundred collections in the Library of Congress’s American Memory website (a central component of its National Digital Library Program) “true” archives. Whatever you call them, taken together these sites are one of the History Web’s greatest achievements and one of its most popular destinations. In the early 1990s, the library distributed optical disks of major collections to test locations around the country and discovered to its surprise that K-12 teachers and students eagerly embraced the digital gifts.13 In 1994, the library began moving these collections to the web. Less than a decade and more than $60 million later, American Memory had posted more than 8 million items. The collections cover every period of American history and almost every type of historical document in the library’s collections, including books and other printed texts, manuscripts, sheet music, maps, motion pictures, photographs and prints, and sound recordings. 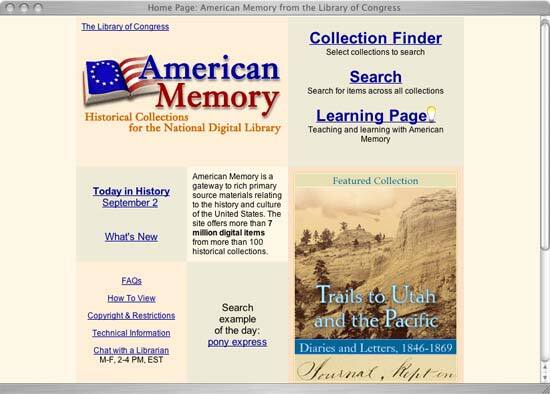 Figure 5: In a suprising bit of understatement for the usually hyperbolic web, American Memory boasts of “7 million items from more than 100 historical collections.” The current count is more than 8 million items. American Memory succeeds because it exploits two intrinsic advantages of the digital medium: accessibility and searchability (despite a cumbersome interface). Using the online version of the Washington papers, the historian Peter R. Henriques undercut the claims of those who insist on Washington’s religiosity by showing not only that Washington never referred to “Jesus” or “Christ” in his personal correspondence but also that his references to death were invariably “gloomy and pessimistic” with no evidence of “Christian images of judgment, redemption through the sacrifice of Christ, and eternal life for the faithful.”14 Historians around the globe, not just those with physical access to the Library of Congress, may now conduct such investigations, and with a speed impossible when searching entailed months of manual turning of pages. Figure 6: Over the past century, artifacts initially found in the Dunhuang caves and other ancient silk road sites have been dispersed among museums and private collections around the world. 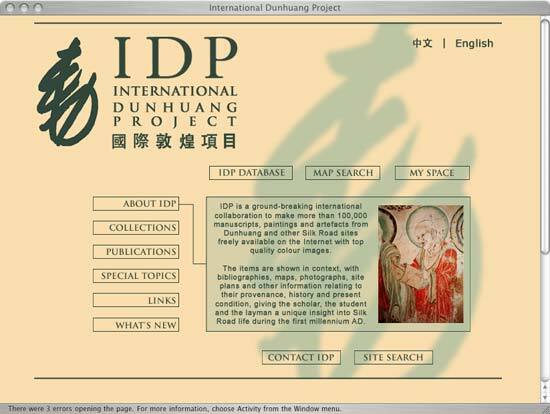 The International Dunhuang Project has begun to reunitevirtuallytens of thousands of these artifacts on its website. The Chinese and English interfaces reflect the international character of the project. Beyond its own collections, the Library of Congress played an important early role in spreading digital archives in the United States. With a $2 million grant from the midwestern telephone company Ameritech (now SBC), the library sponsored a competition from 1996 through 1999 to enable museums, historical societies, archives, and other libraries to create digital collections of primary resources. Twenty-two funded collections on such topics as Chicago anarchists, the Chinese in California, the Northern Great Plains, and the Florida Everglades now reside within American Memory. The ability of digital searching to turn up previously hidden riches applies particularly to records that contain large amounts of detailed information with no easy way to find specific pieces of data. Genealogists, for example, have spent days and weeks pouring over censuses and similar records seeking information on family members. Putting those records into digital form means not only saving the trek to distant archives but also gaining the chance to locate individual names with a quick word search. In April 2001, the Statue of Liberty–Ellis Island Foundation placed online a computer database of the passenger arrival records of more than twenty-two million immigrants who entered through the Port of New York and Ellis Island between 1892 and 1924. Web surfers immediately clogged the site, which was soon the number one destination from the Lycos search engine. In its first year of operation, the site received almost two million visitors. Similarly, volunteers working for the Church of Jesus Christ of Latter-day Saints digitized the records of the fifty-five million people listed in the 1880 United States Census and the 1881 Canadian Census and made them available for free at the church’s FamilySearch Internet Genealogy Service, which averages 3.4 million page views per day.18 Genealogy has long been a grassroots pursuit, but now it has become a cooperative effort whose results are shared among an international community. 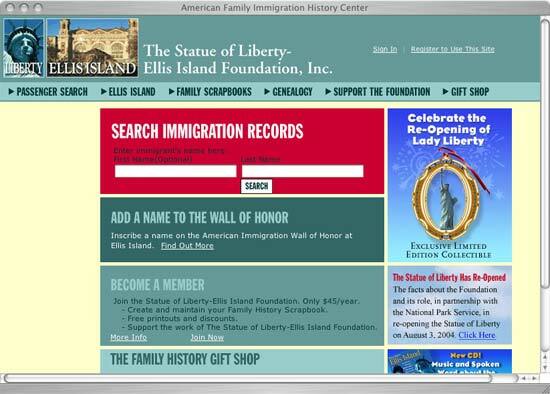 Figure 7: The ability to look for ancestorrs in online immigration records instantly made the American Family Immigration History Center a popular stop on the History Web. The fever to bring the primary sources of the past online that began in the mid-1990s has infected many people—especially scholars and teachers, but also students and amateur enthusiasts—who think differently about documents than librarians and archivists. Their passion generally focuses on a particular historical topic, and they want to make documents related to that topic available online—even if those artifacts don’t necessarily have a shared “provenance” and common association in the manner of a traditional archive. Instead, these website producers create their own virtual collections, often mixing published and unpublished materials in ways that “official” archives avoid. Figure 8: The Valley of the Shadow was one of the earliest sites on the History Web. The copyright notice time span indicates both its pioneering status and the many years it took to complete the project. 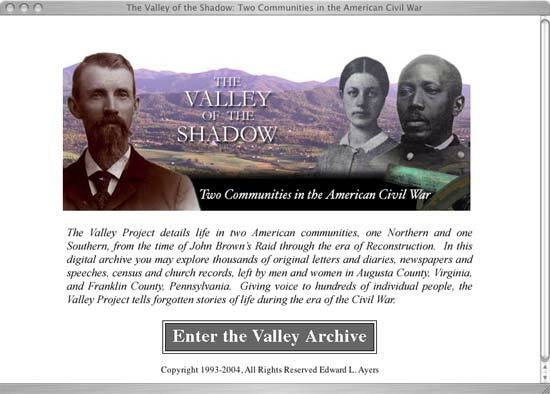 Valley of the Shadow has since developed into a massive compendium of documents about the two communities before, during, and after the Civil War, including tens of thousands of newspaper articles, 1,400 letters and diaries, full census records from 1860, 45 Geographic Information Systems (GIS) maps, and more than 700 photographs and images. The site offers at least an implicit interpretation of these materials rather than taking the hands-off approach of most archives, and this blurring between archive and historical argument perhaps makes Valley of the Shadow and similar sites more like edited collections of documents than traditional archives. 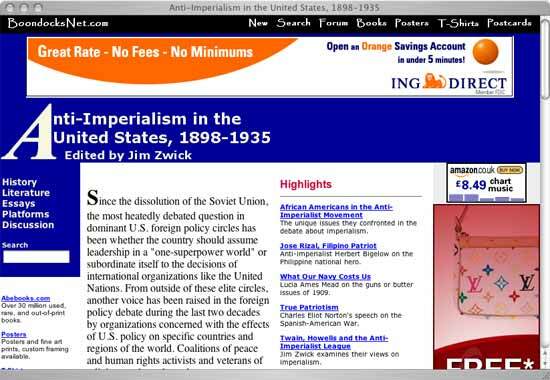 Figure 9: Jim Zwick began his Anti-Imperialism website in 1995 and has kept it going for a decade without any major grants or institutional supports. In recent years advertising revenues have helped to defray some of the expenses. Ayers and Zwick approached the web as scholars. They created sites that grew out of their own research interests. But they quickly encountered a large student audience, eager to touch some pieces of the past, even if only virtually. This should tell us something about the latent interests and curiosity of a vast Internet audience and the potential good service that can be done as online historians. Massive corporate funding (and Google’s soaring stock price) gives the commercial digitizers a key advantage over public sector institutions like the Library of Congress and grassroots archivists like Zwick. They can easily bear the upfront costs of converting paper into marketable bits. Moreover, in addition to the costs of scanning and indexing, the copyright ownership of most of the intellectual products of the twentieth century means that only an entity that can sell access to the past can also afford to purchase the rights to it. Under the Copyright Term Extension Act of 1998 (see Chapter 7), almost everything published after 1923 remains covered by copyright in the United States until at least 2018. As a result, only companies with gated archives like ProQuest can offer the Times of London or the New York Times (and other newspapers) for most of the twentieth century. (Even Google faces sharp constraints on the display of copyrighted works; current plans call for them to display just limited passages and links to libraries, where the book can be borrowed, and Amazon, where it can be purchased.) Not until the twenty-second century will most of the history of the twentieth century find its way into free online archives. 12 See William J. Maher, “Society and Archives” (Presidential Address delivered at the 61st Annual Meeting of the Society of American Archivists, Chicago, 30 August 1997), ↪link 1.12a; “Cataloger’s Reference Shelf: Definition: Provenance,” The Library Corporation, ↪link 1.12b. 13 Caroline R. Arms, “Historical Collections for the National Digital Library: Lessons and Challenges at the Library of Congress,” D-Lib Magazine (April 1996), ↪link 1.13. 14 Roy Rosenzweig, “The Road to Xanadu: Public and Private Pathways on the History Web,” Journal of American History 88 (September 2001), ↪link 1.14. 15 Gallica 2000, ↪link 1.15a; Picture Australia, ↪link 1.15b; Digital Imaging Project of South Africa, ↪link 1.15c; International Dunhuang Project, ↪link 1.15d; “Japanese Old Photographs in Bakumatsu-Meiji Period,” Nagasaki University OldPicture Database, ↪link 1.15e. 16 Joe A. Hewitt, “Remarks,” DocSouth 1000th Title Symposium, Chapel Hill, N.C., 1 March 2002, ↪link 1.16. 18 “The American Family Immigration History Center Fact Sheet,” American Family Immigration History Center, ↪link 1.18a; Statue of Liberty–Ellis Island Foundation, Annual Report, Year Ended March 31, 2003 (New York, 2003), 5; “Facts and Statistics,” FamilySearch Internet Genealogy Service, ↪link 1.18b; “Free Internet Access to Invaluable Indexes of American and Canadian Heritage,” Church of Jesus Christ of Latter-day Saints, ↪link 1.18c; link 1.18d. 19 Edward Ayers, “Living in the Valley of the Shadow” (forthcoming book chapter in possession of authors); Edward Ayers, email to Roy Rosenzweig, 25 August 2003; Jerome McGann, Radiant Textuality: Literature After the World Wide Web (New York: Palgrave, 2001). 20 Jim Zwick, email to Roy Rosenzweig, 27 November 2000; Jim Zwick, email to Rosenzweig, 4 August 2003. 22 Douglas Linder, “Goals and Purposes of the Famous Trials Site,” Famous Trials, ↪link 1.22. 23 Paul Halsall, “Main Page,” Internet Modern History Sourcebook, ↪link 1.23a; Paul Halsall, “Medieval Sourcebook: Introduction,” Internet Medieval Sourcebook, ↪link 1.23b. 26 Jeffrey Cymerint, interview, 1 August 2003; “Gale’s Biggest Digitization Project Ever Covers Eighteenth Century,” Gale Press Room, ↪link 1.26a; Barbara Quint, “Gale Group to Digitize Most 18th-Century English-Language Books, Doubles Info Trac Holdings,” Information Today, Inc. (17 June 2002), ↪link 1.26b. 27 Rosenzweig, “The Road to Xanadu”; “ProQuest Historical Newspapers Preview,” ProQuest Information and Learning, ↪link 1.27a; “Google's Gigantic Library Project,” SPARC Open Access Newsletter, 81 (2 January 2005), ↪link 1.27b.